For the trend-setting Shun Premier Tim Mälzer series, Kai has developed six additional knives made from corrosion-resistant 32-layer damask steel on each side (64 total). It is embellished with a hand-hammered surface which in Japan is known as Tsuchime, thus combining timeless aesthetic qualities with ultimate sharpness. The blades have a massive core of VG MAX steel with a hardness of 61±1 HRC. The paring knife is an indispensible kitchen prep knife. For peeling, trimming, making decorative cu..
A good utility knife is the third member of your must-have kitchen knife line up. In size, it’s betw.. This style of knife is often called a tomato or sandwich knife, but it’s so much more versatile than..
Quite simply, “nakiri” is Japanese for "vegetable knife." If you haven’t used Japanese-style knives ..
Professional or home cook, every cook is an individual. Every cook has certain tools that really wor.. The Shun Premier 7-in. 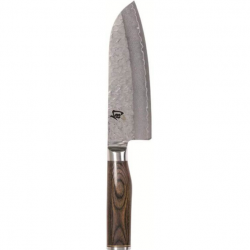 Santoku is a beautiful, Asian-inspired chef's knife that many cooks today hav.. If you bake or buy whole loaves of bread, a bread knife will be one of the most-used knives in your ..
A chef’s knife is a personal choice. That’s why Shun offers so many different lines and blade length.. Your chef’s knife will probably be the most-used knife in your kitchen. If you’re like most cooks, y.. The Shun Premier Slicing Knife can make food look delicious by enabling you to cut thin, even slices.. The two-pronged Shun Premier Carving Fork easily holds food in place while slicing or carving and ev.. Knife set with chef's knife (KAI TDM 1706) and utility knife (KAI TDM 1701)Overall length: 26.5.. Knife set with santoku knife (KAI TDM 1702) and utility knife (KAI TDM 1701).Overall length: 27..
What do knives have to do with it? The truth is that the right steak knife can actually make a good ..